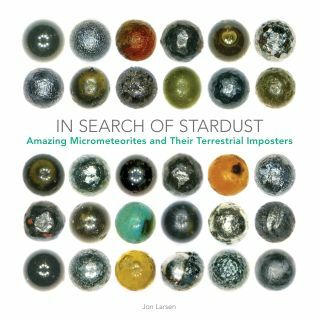 "In Search of Stardust: Amazing Micrometeorites and Their Terrestrial Imposters." The book "In Search of Stardust", made up almost entirely of images, provides a brief overview of how scientists can identify micrometeoroids in populated areas. Completing this task requires scientists to identify the unique features of micrometeoroids, according to the book. Scientists must also be able to differentiate those meteoroids from small rocks that originate on Earth, created through natural or artificial means. Even readers who aren't already interested in micrometeoroids will find the photographs compelling and discover that these very small rocks have very big stories to tell. This slide show features a selection of photographs from the book. Micrometeorites travel through Earth's atmosphere at up to 50 times faster than a rifle bullet, and are exposed to intense heat and pressure. Those conditions can transform the rocks from craggy, asymmetric objects into smooth spheres. Glass spherules, like the ones shown here, experience the highest temperatures — up to about 3,630 degrees Fahrenheit (2,000 degrees Celsius). This "turtleback" micrometeorite is so-named for its shape and texture. The rock's nickel/iron core (the sparkly bit in the center) was exposed during the object's plummet through Earth's atmosphere. Cryptocrystalline micrometeorites are notable for their bumpy exteriors, even though these rocks develop their features in Earth's atmosphere at temperatures only slightly cooler than those responsible for smooth-glass spherules. During their fall, cryptocrystalline micrometeorites experience temperatures between 3,272 degrees F (1,800 degrees C) and 3,452 degrees F (1,900 degrees C). This image shows the interior structure of a micrometeorite, imaged here using a scanning electron microscope. These images reveal information about how the object was formed, and are necessary in order to separate these rocks from terrestrial dust grains, according to the book. A scanning electron microscope image of a micrometeorite reveals complex surface structures. Porphyritic meteorites form at temperatures of about 2,912 degrees F (1,600 degrees C). Barred olivine micrometeorites form of about 3,272 degrees F (1,800 degrees C). These micrometeorites are notable for their rows of thin ridges. Scanning-electron-microscope images of micrometeorites from Project Stardust, an effort to collect these tiny space rocks from populated places on Earth. One of the main challenges of this endeavor was to separate micrometeorites from small rocks and spherules that formed on Earth. These colorful spherules are not micrometeorites; they are created by fireworks and are one example of anthropogenic spherules, (those created by humans). Distinguishing these spherules from micrometeorites is a challenging task, especially when searching for space rocks in heavily populated areas. These anthropogenic spherules come from roof tiles and shingles, which are often coated in fine sand mixed with pigmented, iron-rich glue, according to the book. The book's author, Jon Larsen, writes that he often searches for micrometeorites on the roofs of buildings, and thus must understand how the particles from the roof itself compare to rocks that have fallen from space.